One of my friends from my food coop recently gave me some kefir grains to start making my own kefir. I had tried commercially prepared kefir before and thought it would be fun to try to make my own. I love it and after reading up on kefir, I'm really excited about all the health benefits myself and my family are getting from drinking kefir. Kefir is a cultured-milk beverage which originated in the northern slopes of the Caucasus Mountains and is believed to date back at least 1,000 years. It was developed to preserve milk over extensive periods before refrigeration. It's reported that the tribes-folk of this particular region were renowned for their longevity with little to no known disease. A life span of over one hundred years was common for folks living in the region where kefir was cultured. Kefir is basically a fermented milk product with awesome health benefits. It's a natural probiotic that contains live active cultures of normal digestive flora and will repopulate your digestive tract and aid in digestion. It's thought that kefir is actually superior to yogurt because yogurt is made with transient, less potent bacteria. The organisms in kefir will repopulate the digestive tract with good organisms that can actually overtake pathogenic organisms in the gut. When kefir is consumed, digestive enzymes stores are added to the body. This reduces the digestive burden on the body. This also strengthens the immune system. Eating or drinking fermented foods of any kind adds predigested food full of vitamins and minerals to the body. The lactose in milk is completely digested in kefir which makes it easy for those who are lactose intolerant to consume. Find a friend who has some kefir grains they can share. These multiply quite fast and can and should be separated. I've already passed on some new grains. You can purchase the grains on the Internet, but they can be quite spendy and usually if you ask around someone has some to share. Place the kefir grains into a clean glass jar. Kefir "grains" are a bit of a misnomer as they are actually a soft gelatinous mass made up of friendly Lactic acid bacteria, vinegar-producing bacteria and yeast strains. They are slightly granular in structure which is how they obtained the name kefir grains. Add milk and gently stir or lightly shake to mix the grains in milk. I use raw cow's milk, but raw goat's milk can also be used or raw whole cream. I'm sure pasteurized milk could also be used, but I'm a big fan of the added health benefits of using raw milk. Lightly screw on a lid. Leave the lid loose enough so that carbon dioxide created in the fermentation process can escape. Store the culture out of direct sunlight on your counter or in a cupboard for about 24 hours. Give it a gentile stir or shake a few time during that period. When it's thickened to your liking - and time and experimentation will tell you when that is - strain the kefir through a sieve or slotted spoon. (Some experts say not to use metal spoons or metal of any kind with your kefir.) This will separate the grains from the kefir and you can put the kefir grains int a clean jar with fresh milk and repeat the process. If you don't wish to repeat the process right away, simply store the grains in a small jar, cover them with a little milk, and place them in the refrigerator. They will inactivate in the cold and wait until you are ready for another batch of kefir. You will notice with each batch of kefir that your kefir grain will grow or smaller grains will separate. These are baby grains and can be shared with a friend or mixed in a smoothie and consumed. You can consume it fresh, refrigerate it for later use, or ripen at room temperature over a period of days. Ripening improves flavor and increase vitamins B1, B6, and B9 (folic acid). Kefir has a sour refreshing flavour with a slight subtle aroma of fresh yeast. It also has a natural effervescent sparkling tanginess. 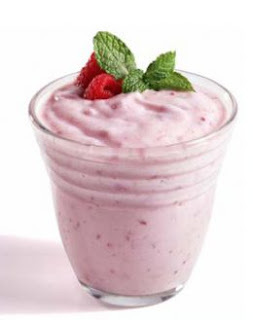 It is especially yummy if blended with some fresh fruit or fruit juice. Add some kefir to your favorite smoothie recipe - it's to die for. It's also the best way to get some probiotics to your kids as they will love the added tangy flavor kefir adds to a smoothie. I also blend up some kefir smoothies and freeze them for popsicles. Here's a great recipe I'm planning to try for Kefir Avocado soup. Blend one avocado, 1 tablespoon red onion, 1-2 tablespoons lemon juice, 2 tablespoons chopped cilantro, 3/4 to 1 cup of kefir, 1/2 teaspoon red pepper flakes in a food processor until smooth. Enjoy. Wow..what great info! A friend is bringing me Kefir grains today and I am a bit nervous about it all.. but not after reading this. THanks so much for sharing. Looking forward to a yummy Kefir smoothie! !